The gap between what is right now and where others are become very obvious when you go from one extreme to another. This past week I spent a little time with a friend I’ve known since kindergarten as he just opened a restaurant in Mexico and I went over to see how he was doing. This is his second restaurant venture for him, his first one closed after a year and a half. 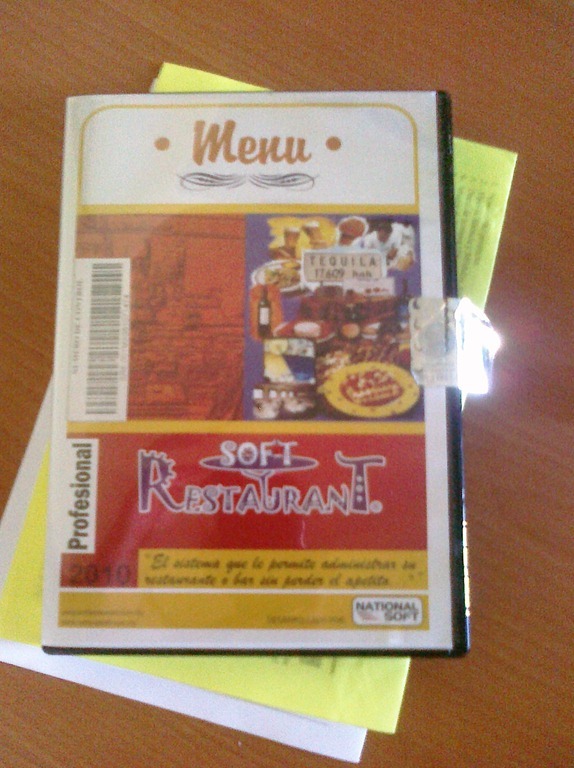 What you see in the picture above is restaurant management software made by Nationalsoft. The software is still delivered in a package, the serial number is taped on the inside (post it note inside the CD) which registers a single computer. The software is less than 15 MB and takes less than a minute to install. Feels like you’re back at the end of the 90’s huh? Wait it gets better! If a user loses their password (which did happen) they have to call support who then has them create a .dat file which they then have to send back to support by email so they can ‘do something to it’ to unblock it. After support does something to the file, they’ll send it back to the customer so he may add it to a folder and overwrite the previous one. Are you kidding me!? What happened to the ‘forgot password’ link that is not a default setting in any kind software? If these people were doing business in the US they would be out of business. But wait, it gets even better…you have to pay them to get the software unblocked. A modern software company not only provides support by phone but also provides customers with online resources such as FAQ, forums or wiki with answers to common problems. Seems Nationalsoft forgot to add this to their checklist because they’re nowhere to be found. Ironically they do have a Twitter account and a Facebook Fan page! None of which are used as customer support touch points. Promote first, serve later right? There’s more but I think I’ve provided you with enough information to see how frustrated I was when I was seeing this happen before my eyes. The way this software company is designed to operate is to deliberately waste their customers time, not to help them get going as fast as possible. Businesses in Mexico still operate by the logic of ‘forcing customers to do what I want them to do’ not ‘I make it easier for my customers to do what they want to do’. The result of operating by this logic is that people who may be interested in your product or service have been programmed to expect ‘below average service’, they expect to be treated like crap. They put more obstacles in place for the customer, never taking into account that the customer is a human and therefore ignoring the fact that humans do make mistakes. In a world where software is as ubiquitous as water, the days of bloated software are over. Today every piece of software (including websites) are designed for humans, not robots. As an example see Facebook’s platform, which now 500 million people use, it epitomizes software designed for making social interaction as simple as possible. Barriers to entry is what you do to make it difficult for competitors to compete with you (like doing everything in your power to make your customers happy). Barriers to use (such as having weak customer support, no online Q&A, making customers pay because they lost their password) is what you do to impede customers from getting on with it and start using your products, and if all goes well they’ll be very happy and tell their friends about it. Humans make mistakes, in the online world it becomes even more obvious because everything they do online has to be done through a digital interface. As software has evolved from being used exclusively used on the desktop to be used on the web, it’s become important to focus on designing your software to anticipate the fact that humans need things to be spelled out for them just like children, therefore making it easier for them to do what they want to do. For example humans will also forget things, including passwords, so make sure you cover the basics. What do you think, is making customers happy an unconventional strategy? Tagged competitive strategy, Creativity, happiness, nationalsoft, Strategy, zappos.